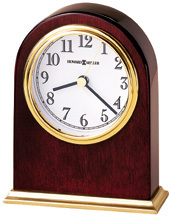 This table clock is arch shaped and offers a brass finished metal base. The white dial features a polished brass finished waterfall bezel, black numerals and hands with a brass second hand. Finished in Rosewood Hall on select hardwoods and veneers.